GENERAL SANTOS CITY – Eight division world boxing champion Manny Pacquiao celebrates his 32nd birthday Friday as he girds towards another chapter of his successful life. A colorful, fiesta-atmosphere affair in what could be his last birthday bash as an athlete is scheduled with the celebration held at the KCC Convention center in this erstwhile Dadiangas town that is fast-becoming a bustling city, which serves as gateway to Southern Mindanao. “Yeah, let’s face it, hindi na tayo bumabata. 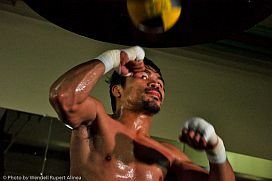 so nasa isip na natin kung ano ang gagawin pa natin in the future,” Pacquiao, who had earlier announced his retirement within three years told this writer in a brief talk Wednesday night, adding though that he is not excluding the possibility of hanging his fighting gloves sooner. In the last 15 years or so of his life, the “Pacman”, as he was also known, admitted having served the country and the word Filipino in the sport he loves most and was very vocal, too, about shifting his service to government service to uplift th4e lives of his countrymen. He has just recently been elected congressman representing nearby Sarangani, province of his pretty wife Jinkee. “Not that I’m announcing my retirement. Medyo malayo-layo pa yan. But, as I have been saying, kailangan ihanda na kung anuman ang gusto pa nating gawin para sa mahal nating Pilipinas at kababayan nating Pilipino,” he stressed. “Matagal nang naghihirap ang ating bayan at dapat lamang na lahat tayong nasa puwesto para makatulong ay magisip[ at gumawa ng paraan kung paano makagiginhawa ang mga Pilipino,” boxing’s pound-for-pound king, who could easily graduate as member of the Philippine Senate and even President, said. Friday’s celebration starts with a mass at 3 p.m. at the Our Lady of Peace and Good Voyage Parish. Some 1,500 invited guests, according to Leean Omega, who manages the Pacquiao family’s business empire, are expected to fill the huge KCC Convention Center inside the KCC Shopping Mall at the heart of the city. President Aquino has been invited but it is doubted if he will honor the invitation as no answer has yet been received from the Palace, but Hall of Fame promoter Bob Arum, top man of Top Rank which owns Pacquiao’s fights, and chief trainer Freddie Roach have been in Manila since Tuesday and fly here early today to join the celebration. Also in town are Arum’s wife Lovee and World Boxing Organization featherweight champion Juan Manuel Lopez to greet the reigning world welterweight and super welterweight kingpin in this, his important day. Pacquiao’s colleague in the House of Representatives and several members of the Upper House, among them Manny Villar, Loren Legarda, Miguel Zubiri, Manny Pangilinan and Bong Revilla have also confirmed attendance. Pageant-filled entertainment program highlighted by encores from the celebrant himself, a known singer, and mother Mommy “D” Dionisia Pacquiao awaits the guests. Well-known entertainers Side A Band, Erik Santos, Laarni Lozada, buddy Philip Salvador and comedians Norman Mitchell, Max Surban and Long Mejia will also be around to make those present happy. Television host Bayani Agbayani will preside over the entire evening of entertainment as master of ceremonies.